They Didn't Have Bows, Did They? A panel from the Franks casket in the British Museum with Egil defending his home with a bow. Note the arrows stuck in the shield. 1) How common were bows, and were they used in battle? 3) How was the bow used?. In the following article I hope to be answering these questions. One of the most common arguments against bows is 'If they were at all common why have we never found many?'. At first this seems a valid argument until you consider that from the period of the longbow's greatness (c.1250 - 1500 AD) not one bowstave , of the tens of thousands known to have been produced, has survived. Indeed, until the discovery of the Mary Rose, we had no medieval bows at all. It is therefore quite surprising to consider that from the first millennium somewhere in the region of 40 - 50 bowstaves have survived with traces of many others having been found. As with most weapons finds, most of these come from pagan grave finds, but they can give us a very good idea of the type of bow in use shortly before, and probably during, our period. 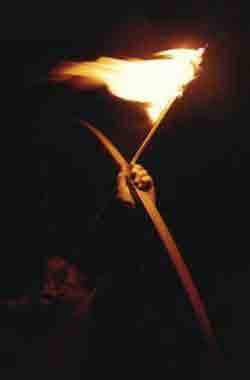 A wonderful if cliched image of a fire arrow. The English Huscarls at Battle with their shields peppered with arrows. The authors of these pieces obviously expect their readers to be familiar with bows and archery terms, so bows must have been well known at the time, even if used primarily for hunting, and there can be no doubt that they were used in battle. Who used them in battle is another matter. We know that the Vikings made use of the bow quite extensively both on land and at sea, especially the Norwegians (recorded as 'Famous bowmen') and the Swedes (the word 'bow' sometimes being used to denote a warrior in Sweden). Even kings were known to wield bows in battle, taking great pride in their skill, and this is shown well in the telling of the Battle of Svoldr in 'King Olaf Tryggvasson's Saga'. It seems reasonable to expect that when the Vikings settled in Britain they would have brought their bows with them and that skill in archery would still be prized amongst them. 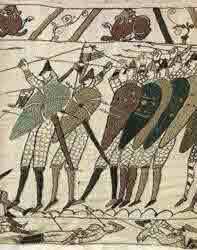 As to how much the Saxons used archery we cannot be so sure. Certainly they knew of, and used, bows both as weapons of war and for hunting. However, whether they were used by the upper ranks of society or just by ceorls is a more difficult question. 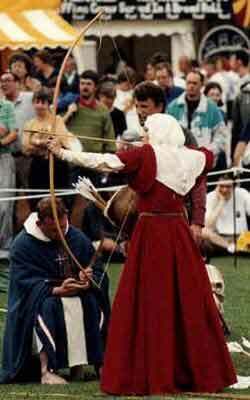 A Norman Lady tries her hand at target archery. The first two extracts from 'The Battle of Maldon' tell us that bows were being used, but not who was using them (Saxon or Viking, Highborn or low). The third extract tells us that Ecglaf was a hostage and that he 'came of a brave family in Northumbria'. To be of any use as a hostage he would have to have been fairly high born so we could argue that the upper ranks did use the bow in war, however we also know he came from Northumbria, an area heavily influenced by the Vikings so he could have just been carrying on the Viking tradition for archery. It seems most likely that amongst the Saxons the bow was used mainly for hunting by the high born although it was sometimes used in battle by the ceorlish ranks. However amongst the Vikings archery was quite widely used by both high and low. There is reliable evidence of Welsh archery eleven years before Hastings in the account of Ralph, Eorl of Hereford, on the expedition he led into Wales. When the Saxon horsemen had ridden into the Welsh mountains they were ambushed by archers who shot so accurately and strongly that, according to the Abingdon Chronicle, 'the English people fled, before ever a spear had been thrown, because they were on horseback'. One estimate from the time puts the English casualties at five hundred whilst the Welsh suffered no losses. Here was a lesson that, if the Saxons had learned from it, could have changed the outcome of the Battle of Hastings; cavalry are helpless against well ordered archers. The evidence for the use of the bow in Normandy before 1066 is even slighter than that for England, though our knowledge of the Battle of Hastings clearly suggests a strong likelihood that military archery in Normandy was by that time well developed. This is made even more likely when you remember that the Normans were descended from the Vikings who we know had a good tradition of archery. A Saxon demonstrating a dreadful loose. The question of what type of bow was used is easier to answer. 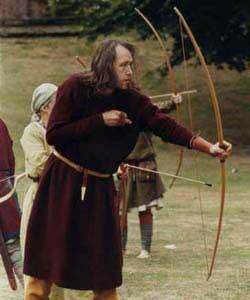 Many 'military historians' claim the longbow  was not used before the twelfth century; this is patently incorrect. 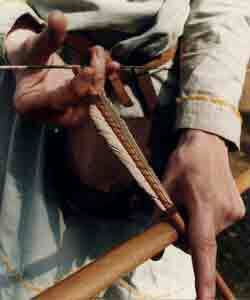 The longbow can be shown to have a continuous use in northern Europe ever since the late stone age. The oldest longbow yet found in this country is a yew bow from Somerset and is dated 2,665 BC, on the continent there is a Danish example from around 6,000 B.C.! As we get into the post-Roman/early medieval period we have a series of bows from Denmark and Germany. They are all made of either yew or fir-wood and they are longbows of deep stacked 'D' section cut from logs of wood, the outer surface of the logs forming the backs of the bows. The length of these bows varies from 1.65 - 1.95m (66" - 78") and in proportion they are almost identical to those found on the Mary Rose. Some of these bows were self nocked, others had nocks of horn or iron, some of them sharp enough to use as weapons at close quarters. Many of these bows were bound round every few inches with linen or sinew tread; it is not certain whether this was purely decorative or was to help stop the wood splitting. Whatever the reason it is something that has been found worldwide from pre-history to the present day so it seems perfectly reasonable to assume it was done to some bows in our period. From the later Viking period several bows are known to have survived, one from Dublin, one from Hedeby and several from Birka. The bows from Dublin and Hedeby are both yew longbows, the Hedeby bow possibly having had horn nocks. The bows from Birka are more interesting as they are short, composite bows of horn and sinew. It is most likely that these bows are not of Viking manufacture but were a trade item from the east. St. Edmund gets his comeuppance at the hands of the Danes. Manuscript drawings and stone carvings invariably show archers using bows of almost their own height or larger which again suggests the use of longbows rather than shortbows. The Bayeux Tapestry is often quoted as a source to back up the argument for bows of the period being shortbows, however those doing so often do not look at all the information this work gives us. If the pictorial evidence of the tapestry is to be taken as truthful in any way, then some of the archers had longer bows than others and the longest bows, in proportion to their users, are longbows. In general the tapestry makers have taken great care to be accurate about the proportions of men and weapons, and men and horses. All the archers in the main panel appear to be using shortbows and this is the evidence that is often used to support the shortbow theory. However, this does not take into account the further 23 archers shown in the lower border. Of these archers most appear to be using longbows. There are currently two schools of thought to explain this; the first is that the Norman archers in the main picture are far better equipped than those in the border so it may be these are meant to be professional soldiers rather than the general levy. If this is so it is quite possible they are mercenary bowmen from eastern Europe, and these archers are known to have used horn and sinew shortbows. They are also known to have sometimes used their bows from horseback as one of them is shown doing towards the end of the tapestry. The other explanation is that the artist is drawing from eyewitness accounts where the fact that a bow is canted over in combat makes it appear shorter from a distance. Until we have more sources we cannot be certain. Note the way the fletchings are also bound onto the shaft. This tells us much about the bows in use by the mid twelfth century, and probably those in use in the eleventh. The reference to horn and ivory show that composite bows were known, and the inclusion of yew shows they knew of this best of bow timbers. The most useful reference though is to the description of the Welsh bows as 'rough and lumpy'; this is evidence that the Welsh bowyers understood the importance of 'following the grain' and leaving knots proud when making a reliable, powerful bow. It also shows that they knew that of the native timbers British elm was a superior timber to British yew for making bows (the best yew for bows came from Scandinavia, Spain and Austria). It is quite likely that these are the type of bows Eorl Ralph faced a hundred years earlier. A perfectly relaxed pose just before the arrow is loosed at the target. 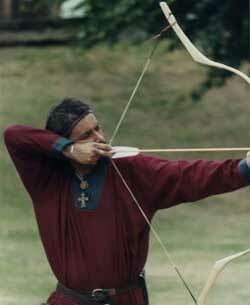 Whilst considering the bow we should also consider the types of arrow that were in use. Fortunately this is far easier to find evidence for since a fair number of arrow shafts and hundreds of heads have survived (again far more shafts than later medieval finds excluding those from the Mary Rose). The shafts are made of hazel, pine or ash, although aspen is known to have been the main arrow timber in the later medieval period. Of the many arrowheads found the majority have been broadheads, with or without barbs. The mail piercing 'bodkin' arrow was known as early as the fourth century although it does not become common until the start of the eleventh century. The earlier arrowheads were generally tanged but sockets become more common through the ninth to eleventh centuries. Other types of arrow head found include barbed fishing arrows and crescent shaped small game arrows . It is probable that wooden blunts were also used for small game although none have been found to date. Bone is known to have been used for arrowheads with examples being found in Denmark and Greenland. Traces of hazel arrows with fire hardened points have been found in Germany although these probably were only used for hunting, and then only by the poor. A few horn or bone nocks have survived although most arrows probably had self nocks cut straight into the shaft. 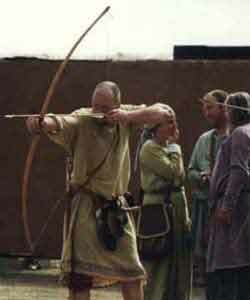 An example of a recurve bow, a type of bow that the Normans were to become well acquainted with during the crusades. Traces of goose feather fletchings have been found and swan and eagle are also known to be good feathers for fletching. Although we can not be certain exactly what shape fletchings were used certain shapes are found in primitive cultures world-wide so it seems fair to assume these would have been used in northern Europe. The commonest shapes are triangular or a long, low rhomboid shape although 'parabolic' and 'hog's back' are also quite common. The Saxons had several words which distinguished a war arrow from a hunting arrow so they probably understood the principle of specialised ammunition. The question of how the bow was used is actually a two part question, firstly how was the bow shot? ; and secondly, how were archers used? 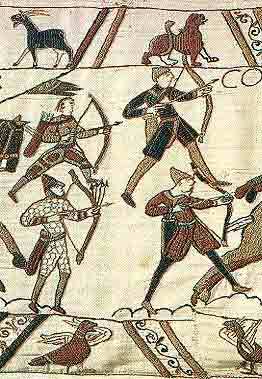 On how the bow was drawn we have one source that shows many archers shooting in the same way; all the archers on the Bayeux Tapestry are shown facing their targets and drawing to the chest, a most inefficient way of shooting . However by the thirteenth century foreign chroniclers refer to the 'English' way of shooting a bow where the archer stands sideways on to his target and draws back to his chin or ear. Did this style of shooting develop out of the style used by the English, Welsh or Scandinavians in this country? 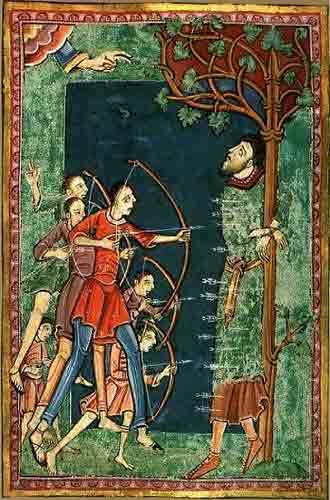 We can not be certain, but certainly several manuscripts from our period show archers shooting in this style. Certainly to shoot bows of the power Giraldus describes this method of shooting would have to be used as it employs the large, strong back muscles rather than the weaker arm muscles. On how the archer was used we have a more difficult problem. It seems from literary and pictorial evidence the Saxon archer acted as a single man although the Normans are known to have used archery units shooting in volleys. The Vikings seem to have used both systems. Certainly both have their merits and drawbacks. A unit shooting volleys can be a very effective way of laying down a 'suppressing fire' although a good shieldwall could withstand this for quite a long time making it a very costly technique in arrows. To be fully effective this technique also requires a lot of training as a unit. A single man acting as a skirmisher/sniper can pick his target well and get a good ratio of arrows to wounds. However he could not inflict massive damage to the opposition if he was having to wait for a clear shot. The other possibility is that archers in our period did what later English archers are known to have done; shoot in volleys at long range where the scale of the attack can make up for the lack of accuracy and then pick individual targets at closer range where the accuracy is better. This is an area which is open to debate, but if you only have a few archers, as the Saxons appear to have, the sniper method would be the most efficient, whereas if you had a large body of trained archers the volley shooting method would be very effective. Certainly both methods are supported by literary evidence; for example in 'The Battle of Maldon' and the extract from Aldhelm we see examples of the single archer whereas in Beowulf we see reference to 'the iron tipped arrow shower, the dark cloud loosed by bow strings' implying the volley shooting method. An archer receives his instructions to 'remove' a leader. Last updated 28 March, 2005. Article by Ben Levick 1992 (Illustrations by Rolland Williamson).